As a new mom, breakfast bagels have become my go to because they’re easy to make and I can eat them one handed while breastfeeding. They’re a great breakfast staple for everyone, and the combinations are endless. As you can see from the list below you can use the same few ingredients and mix them up in different ways. If you generally like topping your cream cheese with veggies, try switching out the cream cheese for hummus. Likewise, you can swap out Nutella and peanut butter, or you can try greek yogurt! You could also switch things up with what kind of bagel you use. My favourites are everything bagel and a good multi-grain, but it’s fun to try something like cinnamon raisin from time to time. 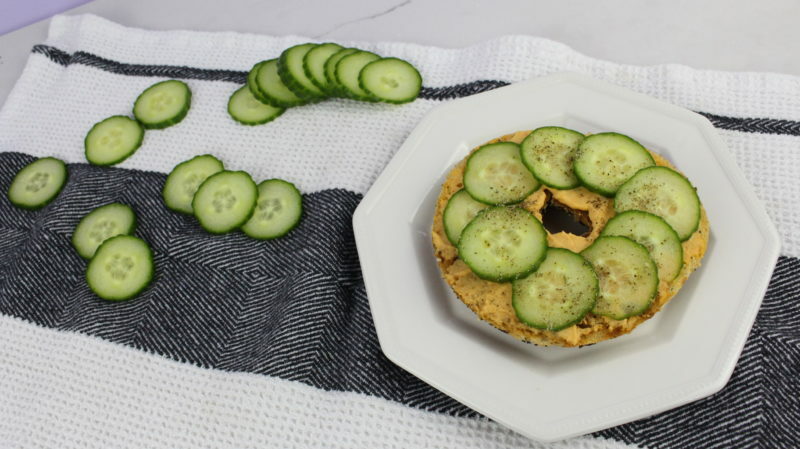 2) Hummus and Cucumber – My mom loves this combo since I talked about it in my other Healthy Breakfast post. 3) Hummus, Arugula, and Tomato – Drizzle with balsamic reduction to take this to the next level. 5) Cream Cheese and Cucumber – Try doing one side with cucumber, and the other side with tomato to mix it up. 8) Avocado and Egg – This has become my new go to. I forgot how good avocado is! 9) Greek Yogurt and Berries – Drizzle with honey and add nuts for a real sweet treat! 12) Peanut Butter Banana – You could add chocolate chips or mixed nuts too. 13) Peanut Butter and Berries – PB&J, yes please! 14) Peanut Butter and Cucumber – My friend from Millenial Motherhood got me to try it, and it sounds weird, but it’s actually so good! There ya have it, 15 fun breakfast bagel combinations. What’s your favourite? I’d love to hear what your go to bagel toppers are. Please comment below so we can check out your recipes too! YUM! What great suggestions! I am totally saving this post! !